Imogen’s plan to become head girl at Lilyworth Ladies’ College is sabotaged when she’s exposed as belonging to a (singularly inept) crime family; to overturn her expulsion, she must prove they were framed for a heist they’re proud of. With mixed feelings, Imogen returns home to Crim House in aptly named Blandington (the setting’s England, the family white). Ever since Big Nana disappeared in a submarine heist gone wrong, the Crims have been bereft of leadership. With the other adults languishing in jail, extremely absent-minded Freddie minds the Horrible Children, who, when not plotting capers, enjoy playing poker (everyone cheats) and setting fires indoors. The thrill of achieving celebrity-criminal status fading, the family confesses to Imogen that they didn’t steal the missing Capt. Crook lunchbox, worth 1 million pounds. With Big Nana gone, all depend on Imogen to discover the culprit. Is it Jack Wooster, Uncle Clyde’s longtime rival? Or Charm Ltd., the company replacing the image of beloved (though evil) Capt. Crook with Capt. Caring on the lunchbox? 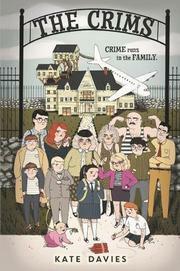 Or come worst, the Kruks, a genuinely successful, scary crime family? To solve the mystery, Imogen first must mend fences with the Horrible Children, whom she’d deserted for Lilyworth. Fans of English humor will enjoy the airily convoluted plot, kid-focused absurdities, and broad satire, all adorned with sly humor, tricky details, and hefty swaths of slapstick.